Thanks so much for this enthusiastic, thoughtful review of my book! I am so glad it resonated with you, and I’d love to hear from you and others who give the Whole Book Approach a try and end up with anecdotes about rainclouds and frozen yogurt or other such things. I’d love to write a follow-up post in a few months highlighting my observations and experiences trying out the Whole Book Approach. I’m especially excited to try it out with the K-3 students who visit the library. Thanks so much, Megan! Megan! We talk about this approach and show your video of Freight Train in our Children’s Lit class! Yes, it was so nice to see the approach in action! That’s great! Where do you teach? 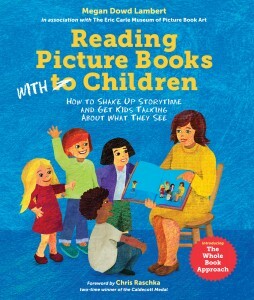 The Simmons College graduate course I’m teaching on the Whole Book Approach at The Carle (July 7-10) includes opportunities for students to observe me leading storytimes, and I’m hoping we can record some. Just read Megan’s book too. It has also given me a brand new way after 20+ years to look at picture books with children. Everyone who works with children and reading, should read this book. I’m illustrations and endpapers in a brand new way!! What a lovely comment! As you know from my book, it’s fair to say that I began with the endpapers when I started to develop the Whole Book Approach. Thanks for the book love! Thank your for this review. I’m going to add this to my wish list to read! Can you give tips on how to do this with large crowds? What do you do if a child, or multiple children, want to talk on and on? Also, sometimes I don’t understand what they are saying, but don’t want to dismiss their thoughts. Ah, the case of the chatty kids! I’ll start with the second point. If I didn’t hear what a child said I would do one of two things: ask them to say it again, or, if we are short on time I would use a blanket statement like, “We have so many interesting things to say today. I can tell you all really like this book. Now let’s get back to the story.” For the first question, I know it can seem like a problem but what a great problem to have! A group of excited and engaged kids who are interacting with the story as you read! If you’d like to control the amount of talking the kids do during a reading, you could try asking them specific questions as you read such as, “How is the character feeling right now?” It might also help to direct the question at a specific child by using their name. That way you’re also teaching about turn-taking. If a kid wants to talk on and on in the middle of a story I might wait for them to stop and then say, “I’m interested to hear what you have to say, but let’s finish reading first. You can tell me all about it during our craft/snack/stamp time. Are we ready to find out what happens next?” It’s important to acknowledge them but also help redirect them. I’ve let Megan know about your question and she may chime in with some answers of her own. You could also try searching the Storytime Underground Facebook page for something like “chatty kids” or “talkative kids” and see if anyone else has asked a similar question. I wish you all the best!